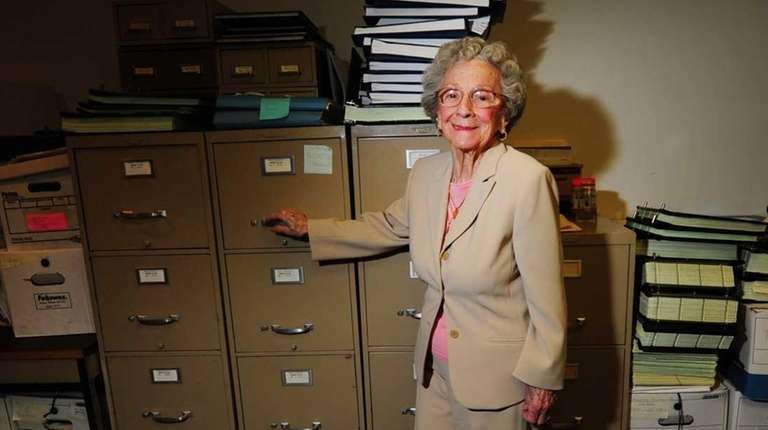 From the age of 18 until her 90s, Dejana worked as an office manager and bookkeeper. Helen Dejana, a lifelong Port Washington resident, was known as a woman who blazed her own path. Her family remembered her as a dynamic and warm woman who charmed everyone around her and inspired people with her work ethic. From the age of 18 until her 90s, Dejana worked as an office manager and bookkeeper — at the same company. She died on Oct. 18 from complications related to Alzheimer’s disease at an assisted living facility in Glen Cove. She was 96. Dejana defied conventions. In high school, instead of specializing in home economics, she opted to learn bookkeeping and take secretarial courses. According to family lore, she was one of the first women to work on a construction site in New York State. She had an infectious, fun-loving personality, said her son, Michael Dejana, 59, of Long Island City. Dejana was born in Port Washington on Sept. 26, 1922, a decade after her parents emigrated from Italy. She attended local schools and graduated from Port Washington High School in 1941. A year later, she started working at Higgins Fire Protection Inc., where she spent more than 70 years. That career feat was featured in a 2012 Newsday article, which also said she had lived in the same Port Washington house since 1927. "I'd hate to leave," Dejana said of her job at the time, "and I'm not going to." In 1958, she married John A. Dejana, who also grew up in Port Washington and whom she met through family. The two were a loving and compatible pair who balanced each other, her son said. They built a life together in Port Washington and raised two children, Michael and Regina, of Port Washington. Dejana's husband died in 1994. She worked part time while caring for her children and was devoted to her job. She retired in 2012, her son said. Co-workers loved and respected Dejana. She knew George B. Higgins Jr., the current president of Higgins Fire Protection Inc., from the day he was born. Higgins said Dejana was more than an employee, but akin to a “big sister” and part of the family. For decades, Helen Dejana's home was the hub for large family gatherings. She was famous for her parties, where the wine flowed freely and Italian delicacies covered the table. Dejana taught her children and others around her not only how to work hard, but also to love those around them and be joyful. In addition to her children, she is survived by two grandchildren and two step-grandchildren. A funeral was held on Oct. 22 at St. Peter of Alcantara Church in Port Washington. Dejana's family requested any donations in her memory be made to the Long Island Alzheimer’s Foundation.